The Mount Gilead volleyball program will be under new leadership this year, as Linda DeMatteis will be the head coach and be assisted by Katie Wells. DeMatteis, who has five years of coaching experience, will return four letterwinners from last year’s team. Kora James earned honorable mention recognition in league play, while Katie Elson, Jessica Brewer and Makenzie Bump also return. With the loss of Olivia Brewer (second-team all-MOAC), Cassie Lyon and Becca Kincaid, DeMatteis will be looking for young players to step up. She cited Haley Dean, Makalyn Strahm, Betsy Barker and Maddie Mathwig as varsity newcomers this year. When it comes to league play, the coach notes there are two teams in particular that will be tough match-ups. 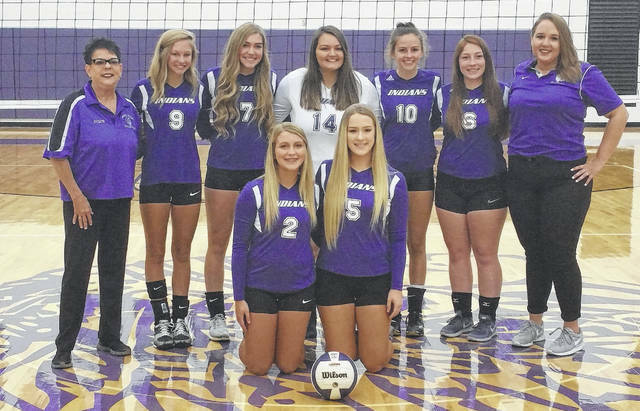 Mount Gilead’s varsity volleyball team for this fall is pictured above.